S.K.I.F.F. 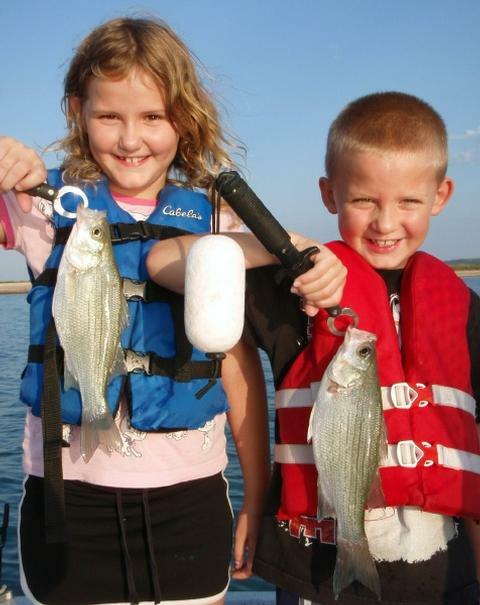 (Soldiers’ Kids Involved in Fishing Fun) exists to take the children of deployed or deceased soldiers on fishing trips at no charge to the soldiers’ families. Kei and Taryn followed instructions to a “t” today and were very successful as a result of their attentiveness. The twins kept up the teamwork and kept the fish coming over the side. Here, Kei is hooked up with a white bass and Taryn clears the downrigger line to prevent a foul-up for her brother at boatside. This morning I fished a “S.K.I.F.F.” trip with 8 year old twins Kei and Taryn Klamert, the children of Sergeant Chris and Mrs. Julie Klamert. SGT Klamert is a U.S. Army cook serving with the 1st Cavalry Division in Iraq. He has 10 months remaining in his tour. The kids were really a joy to have on the boat. They were well-mannered, considerate of one another, and enthusiastic. As we started our day, I explained to the kids that we’d mainly be fishing in two ways: downrigging to both catch fish and find big groups of fish, and then jigging with slabs to take advantage of any big groups of fish we found. With this said, before the sun rose and the fish began feeding, we practiced the necessary jigging technique until both of the children were able to get the cadence and action down well enough to catch fish. We then put the jigging rods away and headed out to search for fish with the downriggers. The ‘riggers worked their magic this morning helping us consistently boat fish that were primarily suspended and scattered. We landed 18 fish in our first 2 hours on the water, all on the downriggers using Pet Spoons. These fish came from between Areas 258 and 853, with the stretch of water from Area 258 to Area 040 producing best. At around 8:30a, we spotted the first indicators that the fish were beginning to school up in advance of a good feed. We saw “wolfpacks” of largemouth bass chasing shad at the surface and coalescing groups of white bass forming on the bottom. We brought in the ‘riggers and I began making sonar sweeps over the areas where we spotted such activity. Eventually we found what we were after on sonar and I e-anchored over these fish and put the kids to work. The “practice” round done before the fish got going really paid off here as there was no learning curve for the kids to go through. As soon as their slabs hit bottom, they knew what to do and they began catching fish immediately. Our last two hours on the water consisted of spot-hopping from place to place as we found topwater action, fleeing bait, and white bass bunched together on bottom. In the last two hours Kei and Taryn caught 33 more fish, nearly doubling the catch rate of our first two hours. We boated fish at Area 857, 858, 859, 860, and then, after this shallower bite settled down, found them out at Area 856 in about 5-6 foot deeper water. By 10:30 we were idling through the no-wake zone for an on-time linkup with mom who was able to enjoy some kidless down time for 4 hours. As we neared the dock, Kei looked up at me and said, referring to our catch today, “Not too shabby, Mr. Bob.” I smiled a very big smile!! We kept our last two fish in the livewell for a bit of show-and-tell and a quick photo op with mom. We ended the day with 51 fish caught, including 47 white bass and 4 largemouth bass. Kei had visions of boating a longnose gar, and indeed we saw a number of them surfacing today, but the capture of one would elude him … thereby establishing grounds for another trip in the future!! Thank you AFF and friends of SKIFF for providing opportunities like this! Wind: Winds were S5 at trip’s start turning SSW6 my mid-trip, then WSW4 by trip’s end. Skies: Skies were ~10% cumulus clouds on a blue sky. A grey cloud bank in the east obscured the sunrise for ~10 minutes, then cleared to bright and near-cloudless for the remainder of the trip. This morning I fished with Mr. Rob R. of Round Rock, and his two sons, Drake and Grayson. From L. to R., Rob, Drake and Grayson show the best 6 of the 68 white bass we boated today. We also landed 2 largemouth and a drum. Though not yet in their teens, both boys have had a great variety of angling experiences from bank fishing ponds for catfish to pursuing offshore grouper and kingfish in the Gulf and the Caribbean. Despite all the experience, neither boy had ever landed a white bass before, and with a strong white bass bite going on at Stillhouse right now, we set out to change that statistic. We met before sunrise, did some practice casting in case we found topwater, then we did some practice jigging in case we found white bass near bottom, then we set out on the hunt for fish. We encountered abundant, scattered, suspended white bass along the contour running from Area 258 to Area 040 to Area 854. From sunrise to exactly 8:57am we boated 24 fish, including 23 white bass and one keeper largemouth bass. At exactly 8:57, I spotted the first (and only) school of congregated, bottom-oriented white bass that we would find this trip. I buoyed them and we went to work with our TNT 180 slabs. In about 35 minutes’ time, with all three of my guests boating fish each time they jigged, we took our fish count from 24 up to 69. Of these 45 fish, 44 were white bass and 1 was a freshwater drum. This was our second “first” of the trip, as Drake had never boated a drum before, so, he got to add another notch to his species belt with that accomplishment While the bite was hot, I had all three using slabs. When the intensity began to fade, I left the boys using the slabs, and had dad turn to a “blasting” technique to try to coax fish in from around the perimeter of the boat to the boys’ slabs. This extended the bite a bit and netted us a few extra fish. This bite took place on top of Area 854. Once this bite died, the morning bite was all but over. We returned to downrigging and combed back over this area taking only one lone largemouth (a short fish) for our efforts. We packed up and headed to between Areas 855 and 495 and, despite seeing tremendous amounts of bait, came up with only two short whites to close out our trip with a tally of 71 fish. Wind: Winds were SW5 at trip’s start turning WSW and increasing slightly to 8mph near trip’s end. Skies: Skies were ~10% cumulus clouds on a blue sky. A grey cloud bank in the east obscured the sunrise for ~15 minutes, then cleared to bright and near-cloudless for the remainder of the trip. 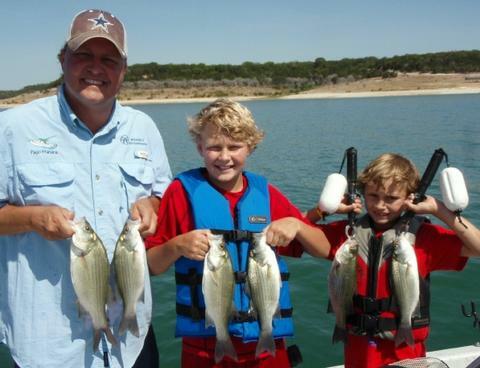 I fished today with Mr. Andy S. of Belton, and three of his four children — Sullivan (13), Jaxson (8), and Kelsey (6). 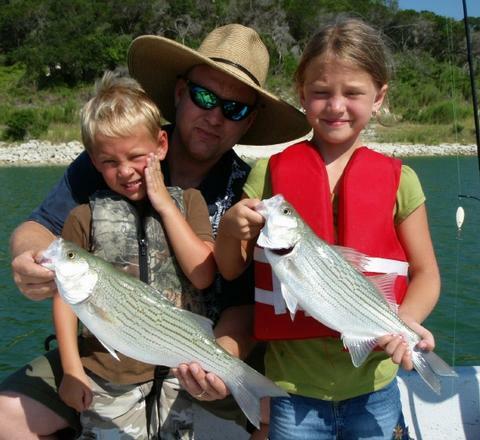 This was a “Kids Fish, Too!” trip, so only the kids fished — and they tore ’em up!! Jax walked away with the trophy today when he boated this 4.75 pound, 20.25″ largemouth. Sully bagged a big one of her own, boating this 16.5 inch largemouth. 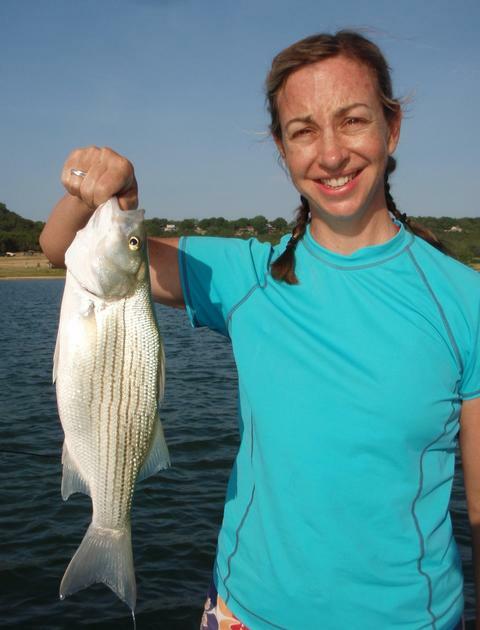 And Miss Kelsey contently displays one of the 47 white bass that turned on well for us with the breezy south winds. Fishing really couldn’t have been much simpler today. We found abundant fish at the first area I began searching over this morning and although the fish slowly transitioned from place to place, they never left this vicinity, so, we spent no time traveling in search of fish nor scanning hopefully with sonar, we simply fished from start to finish over willing schools of white bass with occasional black bass mixed in. We fished along the contour stretching from Area 258 to Area 040 to Area 481. From sunrise to around 8:35, our best success came from the southern end of this expanse of water, close to Area 040. As the morning progressed, the fish slowly moved north, and were located closer to Area 481. In the midst of all this, I spotted a tightly bunched school of white bass on bottom right on top of Area 853. I buoyed these fish and, for about 25 minutes the kids boated fish after fish putting a quick 15 fish in the boat using slabs, and taking our tally from 24 fish (all of which had been downrigged) up to 39 fish very quickly. When the school dissipated, we returned to the downrigging that had treated us so well up to this point, and we continued to put fish in the boat. Our last 90 minutes on the water was (as is often the case on morning trips) slower than the first part of the trip. During this time, we boated 10 additional fish, 8 of which came on the downriggers and 2 of which came on slabs. These slabbed fish were our last two fish as my youngest guest Miss Kelsey was beginning to play out and it was clear the the best of the morning bite was now well behind us. Wind: Winds were S7 at trip’s start, slowly increasing to S13. Skies: Skies were ~30% cumulus clouds on a blue sky. A heavy grey cloud bank in the east obscured the sunrise for ~30 minutes and high, thin cloud cover at our trip’s mid-point made the increasing temperatures bearable. This week of 18-22 July, I’ve been intensively involved leading our church’s Vacation Bible School and did not book any trips so as to devote full attention to that effort. I did make it out on two evenings on Stillhouse just to try to keep up with the movements of bait and gamefish with the rapidly dropping water levels so once my schedule lightens I can once again get clients right on the fish. Densely grouped white bass on this area made for very productive slabbing while they “stayed put”, which usually isn’t too long in the summer when fish metabolism is high and fish are patrolling regularly. These two evenings I found the fish fairly sedentary until about the last hour before sunset. On the 18th, with calmer winds, I found “wolfpacks” of largemouth bass and some larger schools of white bass pushing bait to the top and feeding at the surface just briefly to the E of Area 251. I observed these fish as I fished on Area 251 after seeing excellent sonar readings of fish using this underwater irregularity. Both evenings fish were located on the side of this feature impacted by the wind. On the 18th I boated 14 white bass all by way of slabbing, as well as 5 topwater largemouth on a Cork Rig. On the 20th, there was no observable topwater action. 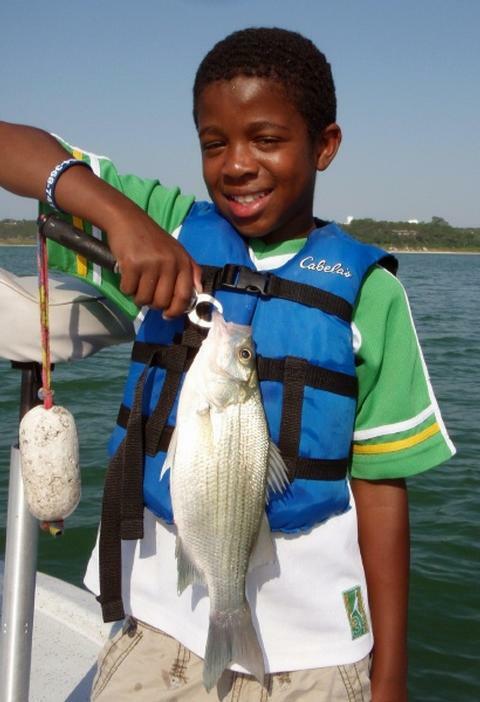 I caught 24 white bass and 1 drum, all on the slab. TALLY = 19 Fish on 18 July and 25 Fish on 20 July. Wind: Winds were S4 on 18 July and SSE8 on 20 July. Skies: Skies were fair and 20% clouded with cumulus clouds. I fished a morning half-day trip of ~5 hours in length today with Bernard and Trish K. of Austin, and their two children, Benjamin (8), and Amanda (6). 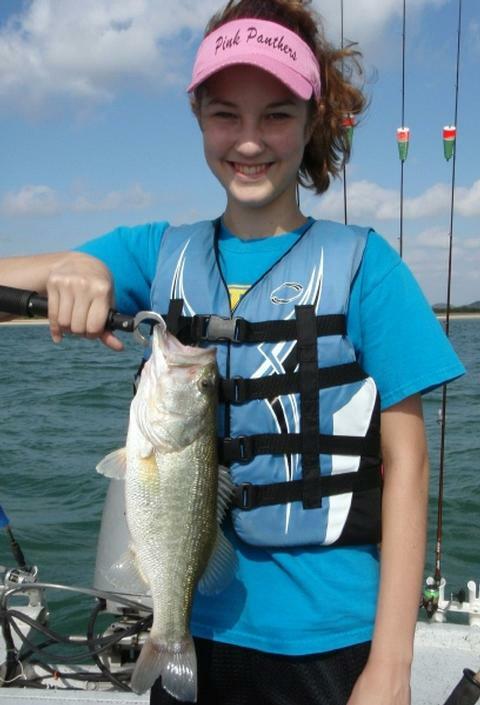 Amanda K. of Austin with her first fish caught as an adult!! She attributed much of our success today to all the gadgetry onboard the boat, thus potentially greasing the skids for husband Bernard to obtain some more fishing gadgets of his own!! Truly an enviable position for any fellow to be in! Benjamin, a young man with a penchant for precision, “nailed it” almost every time as he let the downrigger balls down to “just the right depth” time and time again today. It paid off!! This family just returned from a whirlwind summer vacation trip of a few days in length down to Sea World, and between the late return home the night before the trip and the early wake up the morning of, little Miss Amanda never really made a showing today. 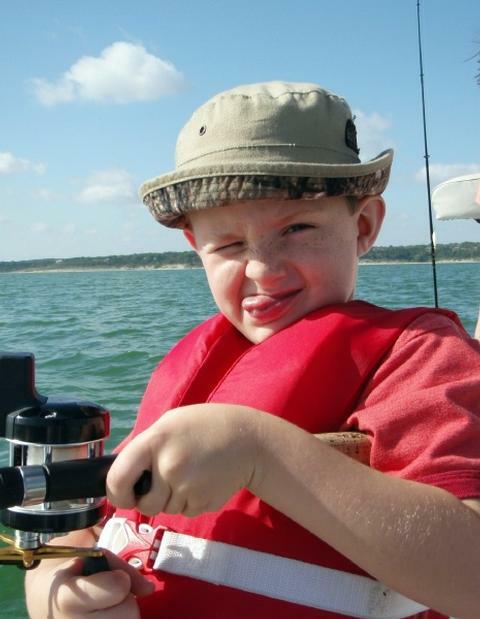 Young Benjamin, on the other hand, was ready to go, had a laser-focus on the fishing activity and stayed enthusiastic and engaged the entire time. 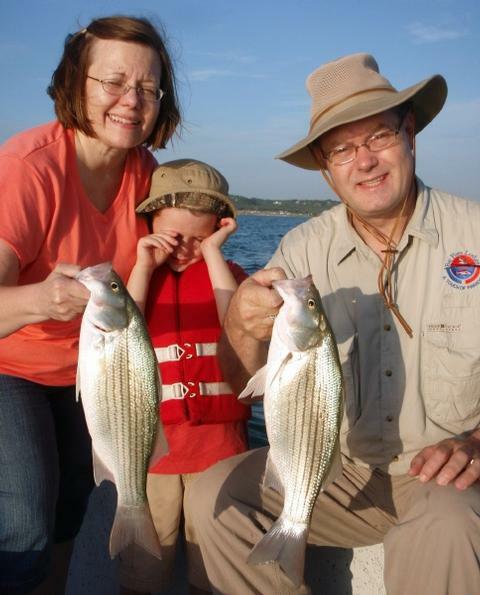 Dad had done quite a bit of fishing, so he left the fishing mainly to mom and Benjamin to enjoy on this outing. We experienced an easterly component to the S. wind this morning, and, as I’ve noted for the past 4-5 weeks in this blog, that seems to dampen the fishes’ mood a bit. They didn’t shut down or anything, but it required more passes over more fish to comb out the active fish among them. Our first hour gave up one strike and no fish boated — the slowest start we’ve had in over 3 weeks. By 7:25 we headed to Area 833-214 and picked up our first two fish — two white bass which both struck the larger of the two baits we had out — the Swimmin’ Image. As we came in view of the Area 830-831 complex, it was as if nature very suddenly woke up. Whereas just a few minutes previously I had commented on how there were no deer drinking, no buzzards flying, no songbirds singing, and no bait flipping, all of the sudden we saw buzzards, observed a flock of cormorants begin to feed in the water, saw martins began to sip insects from over the surface of the water, and saw some topwater eruptions began to occur as white bass and hybrid began to push shad to the surface. We slipped over to the topwater action and immediately boated 5 fish on Cork Rigs with 2 more lost right at boatside. As the fish quickly settled back down, we then went with a smoking tactic using slabs and put 9 more fish in the boat with one more lost at boatside right at Area 848. Once I saw that the concentration of fish was beginning to thin and knew that the heaviest of the feed was subsiding, we went right back to a downrigging regimen and put two more fish, both keeper hybrid, in the boat at that time. By now, (around 9:30) Miss Amanda had reached the limits of her attention span, so, dad very unselfishly opted to take her on over to a swimming area as a suitable distraction while allowing wife and son to continue to enjoy the fishing. We hit a bit of a lull during which time we picked up just one hybrid, but then got back into the fish, finding a mix of white bass and short hybrid, this time showing a preference for a mid-sized Pet Spoon. We downrigged Area 686-844 thoroughly and combed out 11 more fish in our last 45 minutes before calling it a day right around 11:15. Unfortunately the falling water has all but eliminated the sunfishing option we usually have this time of year to offer to younger children. The shoreline cover like logs, brush, man-made objects, and (on Stillhouse only) aquatic vegetation, is now all high and dry and the sunfish have pulled way back from the banks in most cases. Thus, the use of downrigging to both catch fish and to help find active fish that can be worked over more thoroughly with other tactics, is about the only thing that I’m having consistent success with. The “slabbing” crowd has really thinned out due to lack of success near bottom and the topwater is definitely off since the last good feed I observed on 02 July. That’s summer fishing — suspended fish and short bursts of action otherwise. Wind: Winds were SSE5 at trip’s start, slowly turning S6. Skies: Skies were ~20% cumulus clouds on a blue sky. I fished today with Steve and Lisa N. of Temple, and their 6 year old grandson, Caleb. This pair of 18″ hybrid came out of a “wolfpack” of about 6 fish we spotted on sonar seconds before they struck. When the tongue came out, the hybrid began to tremble. The fish I am finding on Belton right now are suspended and just refuse to hit anything going vertically. I worked over the same stretch of water as several “regulars” today — mostly retired fellow that fish all the time. They were slabbing and their catch was in the single digits today whereas we ended up with 33 fish and could have kept right on catching but had to be considerate of the attention span of the 6 year old in our party. Today’s trip was a typical, average summertime trip. We caught fish steadily over just about the entire duration of the trip, save on lull from around 8:00 to 8:20. At 9:00 to 9:35 we saw the peak activity for the morning. During off-peak times, we’d have to pass over 5-6 pods of fish, each pod containing 3-8 fish, in order to get one fish to bite. During the peak we got fish from every other pod we passed over. We downrigged for 100% of our trip today boating fish from the patch of water found along the trace from Area 478 to 488 to 814 up until around 8:25. The action slowed here and I made a move to test the waters from Area 833 to Area 846. We picked up 3 small fish here over about a 35 minute span. I decided to leave these fish and go back to the patch of water found along the trace from Area 478 to 488 to 814, as we had left a lot of fish there showing on sonar but just not biting. As we arrived here, the fish were right where we’d left them. We were fortunate in that we boated a healthy white bass the regurgitated its morning meal at boatside. I observed that the fish it had eaten were smaller than the presentation we were using, so, I downsized our lures and from that time on we kept rods popping on both hybrid and white bass. The downsizing of our lures made a very distinct difference in our success. By around 10am young Caleb had reach the limits of his attention span and we thought it wise to wrap up the trip then and there as grandma, grandpa, and I had all run out of tricks to delay our departure any longer. By trip’s end our tally stood at 33 fish, all caught and released, and which included 5 keeper hybrid, all right at the 18.00 to 18.50 inch mark. Q: What do you get when you cross a Marine with a soccer coach? A: Hybrid!! Today I had the pleasure of welcoming brothers-in-law Paul J. (the soccer coach) and Will G. (former marine and current Texas Housing Dept. employee) aboard. Will landed the big one today, a 4.75 hybrid that fell for a downrigged shad imitator. We had multiple doubles today wherein both fellows had fish on at the same time as the fish showed up on sonar in “wolfpacks” of 3-6 fish per group. These were both young, athletic guys, and both just a wee bit competitive (I think one shoved the other out of the way to be the first one on the boat this morning!). I always enjoy having athletes on board as their coordination is always good and they are often used to listening (well) to coaching. Both of these pay off when the subtleties of any technique I teach are explained and then are able to be applied without a steep learning curve. Such was the case with Paul and Will. I showed them only a time or two how to rig a downrigger spread and they were doing it independently thereafter, leaving me to focus on sonar and taking fish off the hook, which, in the long run, resulted in more fish as I was able to concentrate on the important task of locating fish and staying with them. We located 3 distinct concentrations of fish today, all of which were suspended at 23-29 feet over deeper bottoms. The downriggers were the key to success today as they kept our baits “in the zone”. We found fish pre-sunrise to about an hour afterwards between Areas 841 and 843. During the mid-morning we found fish between Areas 843 and 487. Then in the late morning we found fish between Areas 846 and 214. Over this course of time we stopped 4 times to jig for fish and got exactly ONE fish for the efforts. These fish are definitely into a horizontal movement. I witnessed very few “slabbers” doing much this morning, although live shad fishermen who understood that the fish were suspended and fished accordingly were catching some fish. Our largest fish today was a nice 4.75 pound hybrid that Will boated. He also missed one that we were sure would have beat that one out. I should mention here that I believe I witnessed Paul do a silent fist-pump when that unfortunate event occurred (I told you these guys were competitive!). I fished a little longer than I have been lately as the fish continued to bite well up to around 11am as the SSW wind picked up and helped us out a bit. Our final tally was 56 fish, all caught and released, with 8 of these fish being keeper (18+ inch) hybrid, mixed with other short hybrid and white bass of all sizes. Wind: Winds were S7 at trip’s start, slowly turning SSW10. Skies: Skies were fair, dry, and bright with high thin clouds until around 9:30am. This morning I was joined by Dave W. and his dad, Dwight. Dave is an electrical engineer and UT grad working in the semi-conductor industry in Austin, and Dwight is retired from the Texas Parks and Wildlife Dept. where he worked as an administrator over state parks. 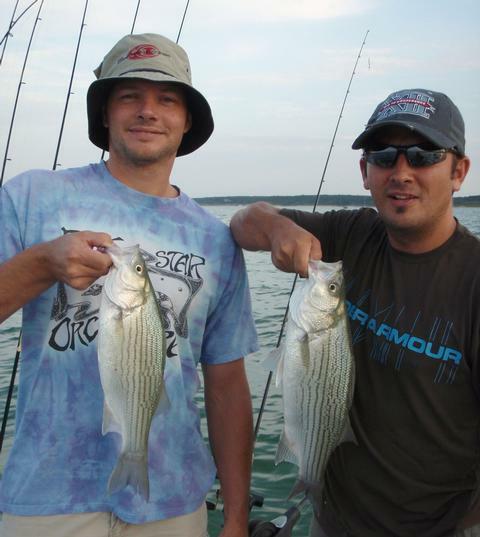 Dwight (L.) and Dave (R.) with 4.25 and 3.25 pound hybrid striped bass caught on slabs this morning on Belton Lake. Today, for the 3rd trip in a row, there was no topwater action found in the areas we surveyed at first light. With the majority of the fish we’ve been finding being suspended, sonar interpretation is critical. Once fish and/or bait is found, I’ve been downrigging to both catch fish and to find “jiggable” concentrations of fish. Once congregations of fish are found, the action has been typically lasting 15-20 minutes and then drying up as the fish continue to move in constant pursuit of bait. Action first picked up for us in an area triangulated by Area 841/843/845. 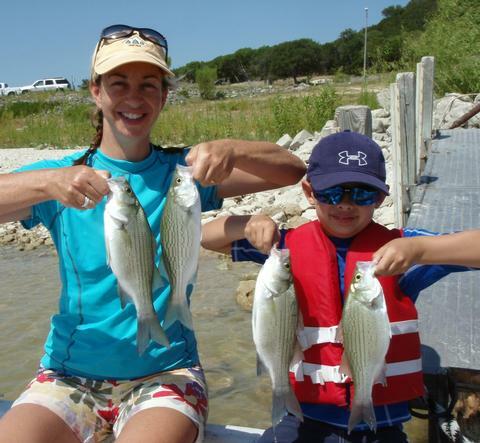 We downrigged with Pets and picked up a mix of white bass and short hybrid. Next, we moved on along this same contour line and found fish in a ellipse between Area 840 and 488. We caught a majority of our fish in this vicinity primarily via downrigging and during one round of jigging for concentrated fish. All but one of our 14 keeper hybrid caught today came from this area. Once this tailed off I checked a few areas and came up empty until looking over the patch of water triangulated by Area 833/214/474. Here we found fish a bit deeper — down at 26-28 feet and continued catching fish, although the morning bite was on the downhill slide by this time with the heat and light level rising and the winds beginning to subside. By the time we’d boated our 47th fish, we felt we were to the point of diminishing returns and decided to leave the ‘riggers down as we prepared the boat for travel and got ready to head in. As we idled along, the wind speed suddenly picked up. No sooner did this happen than I noted a sizable concentration of fish at Area 844. We boated 1 on the ‘riggers as we passed over and I immediately got us rigged up to jig for these fish. We managed 4 more fish here on slabs and finished out the day on a great note with 4 more fish coming over the side in just a few minutes. Of the 52 fish we boated today, 14 were “keeper” hybrid, exceeding the 18″ minimum length set by TPWD on this species. Wind: Winds were S5 at trip’s start, slowly turning SSW7-8. Skies: Skies were fair, dry, and bright with no clouds. This morning I welcomed aboard a family of four from The Woodlands, Texas — Charles and Jodi C. and their children, Madison and Mason. 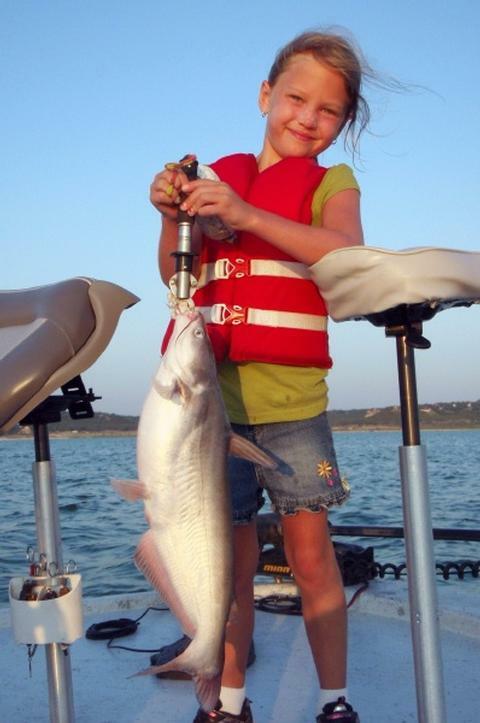 Madison’s 2nd fish of the day was this record-breaking 5.00 pound, 23 3/8 inch blue catfish taken on a Pet Spoon. Mason and Madison doubled up on hybrids from the deep toward the end of today’s adventure. Nature seemed to be a little out of sorts this morning. Winds had a slight easterly component (which never helps the fishing) despite a forecast for mild SW winds, we didn’t see a lick of topwater in the low light period prior to sunrise, and even the downrigger bite on suspended fish was tough. 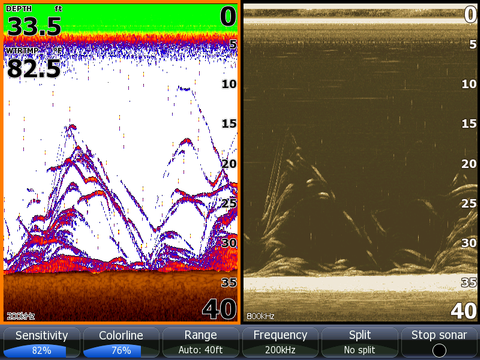 For every 80-100 fish showing on sonar we’d only pick up 1 or 2 fish. It was just one of those tough days. All of our fish today came via downrigging on both Pet Spoons and on the Swimmin’ Image. Our first spot of success came at the patch of water contained within Areas 840, 841, 843, and 488. These fish came at 24-26 feet over a deeper bottom. Toward the end of our trip we also picked up a few fish between Areas 813 and 474 from out of 27-30 feet of water over a deeper bottom. Madison emerged as the star of the show today. Her second fish hit hard and battled long. She put her all into fighting what turned out to be a very healthy blue catfish. As soon as it neared the surface I suspected it may be a record, and by the time I’d netted it, I knew it was a record, beating out the former record by 1 1/8 pounds set last autumn. I spoke with several “regulars” out on the water today and everyone had experienced similar results — slow fishing for scattered fish. We ended up our trip over in Frank’s cove poking around in the shallows for panfish, but the resident hen mallard and her flock of ducklings stole the show. We did manage to boat a blacktail shiner and a green sunfish while on location, but, the novelty wore off pretty quickly as the sun grew hotter and the winds calmer. We finished up today with a total of 20 fish. 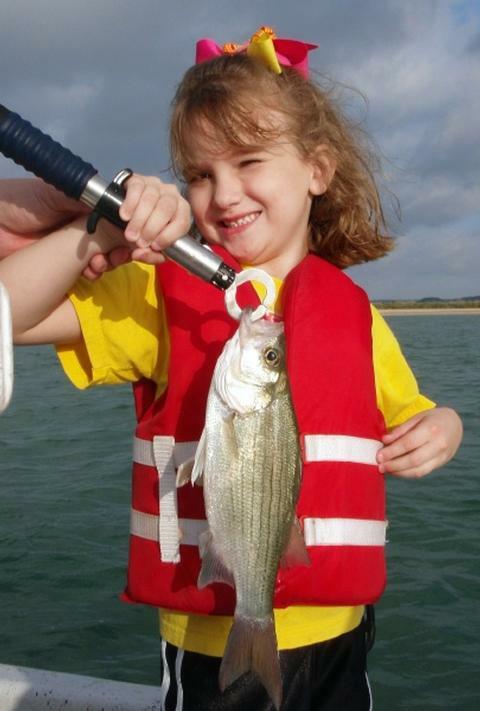 Congratulations, Madison, on your big catch. Wind: Winds were SSE6 at trip’s start, slowly turning S4. This morning I met Mrs. Lovette Vassar in Harker Heights, TX, to pick up her daughter, Sydney for SKIFF trip #13 of the year. 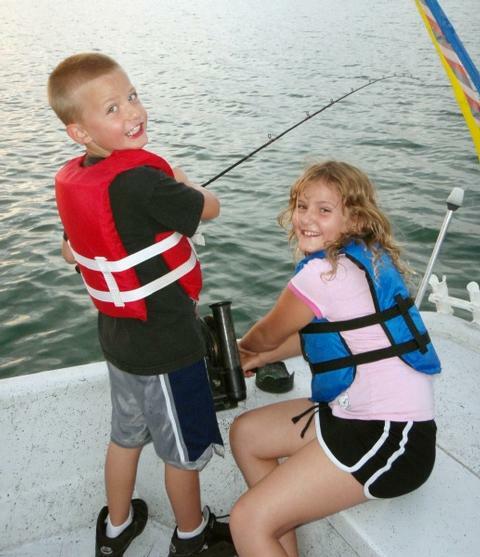 Sydney was planning to bring a girlfriend of hers from church, but plans fell through and so the nod went to younger brother, Josh, who came out with his older brother on a SKIFF trip over Spring Break. So, the SKIFF trip was actually just for Sydney, but Josh got to go along for the ride — little did he know it would be his lucky day! 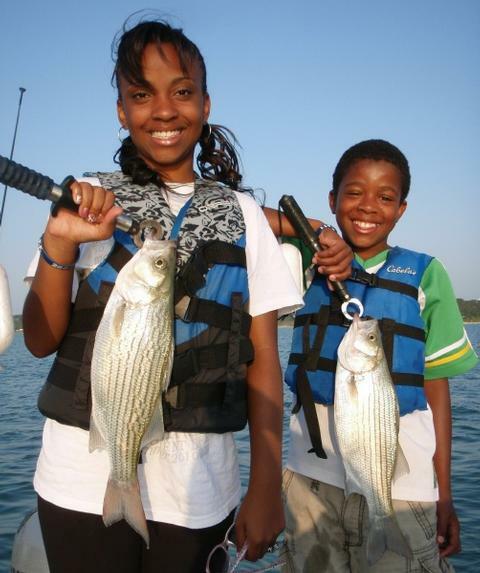 In under 35 minutes on the water, both Sydney and Josh had boated one legal hybrid a piece and several other short hybrid, as well as white bass. 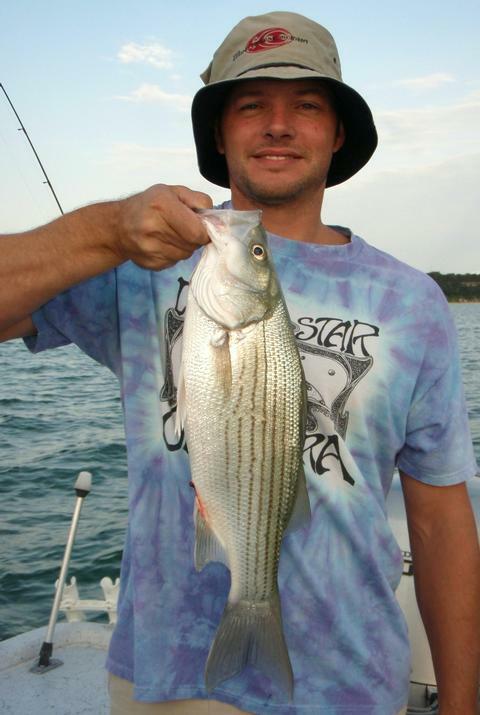 Near the end of our trip, Josh bagged this new Belton Lake record white bass. 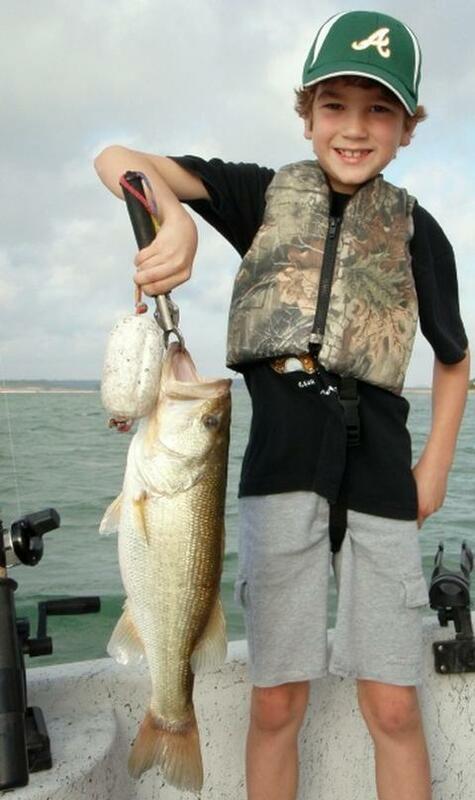 The current Catch & Release record measures 14.88 inches; Josh’s fish measured 15.375 inches. It came on a 3/4 oz. TNT slab fished over 33 feet of water. Just to get you in the right mindset for this whole narrative, you’ve got to think “city girl” when you think about Sydney. Her hair was all braided nicely, her fingernails were all polished well, she had an ornate silver ring on her right hand, and her super-cool sunglasses completed the whole image. Don’t get me wrong — Sydney is very well-mannered, very articulate, very considerate, and very easy going — she just hasn’t had a whole lot of outdoor experiences. So, as we load into the boat, get lifejackets on and push away from the courtesy dock, I let them know we’ll be going around 30mph to get to our first fishing area. As I cleared the no-wake zone and throttled up, a screech arose from in front of the console where Sydney was seated. She screamed, looked back at me wide-eyed and said, “Okay, where are the seatbelts!?!”. We soon got settled in over some shallow water hoping for some topwater action, but, none materialized this morning. By 6:35 it was apparent the fish were not going to show themselves on the surface today, so, we began plying our trade in deeper waters. We downrigged successfully for about 2 hours straight in a patch of water triangulated by Areas 834, 840, and 488. We found suspended schools of hybrid striped bass and white bass down around 24-27 feet and ran Pets behind our downrigger balls to ferret them out. I watched sonar continuously hoping to see a congregation of fish dense enough to allow my rookie anglers to jig successfully, but that didn’t materialize until well into the morning. By 8:55, we’d boated 35 fish, all on downriggers, of which 21 were keeper (18+ inch) hybrid (that’s an unusually high proportion of keeper hybrid for Belton Lake!). Most of these were right at the 18.00″ to 18.50″ size, with 2-3 pushing 19″. Around 9am we did finally find a sizeable school of fish in the lower 1/3 of the water column in 33 feet of water. I was initially drawn to this spot after seeing a quick burst of topwater feeding activity. As I motored over the area I’d mentally marked, sonar lit up and I put us into a hover over this area. We got our slabs (TNT 180’s in 3/4 oz. white) down to these fish and “smoked” the slabs to provoke the fish to hit. We boated a mix of fish here including 4 more keeper hybrid, several short hybrid, and a mix of legal and short white bass. The last white bass that struck here was on Josh’s line. When he brought the fish to net, I could see it was a nice white bass that just dwarfed the other white bass we’d been catching. I measured and weighed the fish and used my iPhone to consult the TPWD records database and found that the fish beat out the current Jr. Angler Catch and Release lake record (determined strictly by length) by exactly half an inch. We took all the required photos and I’ve since submitted the record application to Joedy Gray at TPWD who manages the Angler Recognition Program. That white bass was the last fish we caught on Area 841, and the fish were beginning to thin out now as we approached 10am, after having boated 12 fish off that small patch of water. I suggested we run the ‘riggers again to shoot for one more fish a piece and then call it a day. The kids, who both had sweaty brows by now in the near-windless, humid conditions, thought that sounded good. 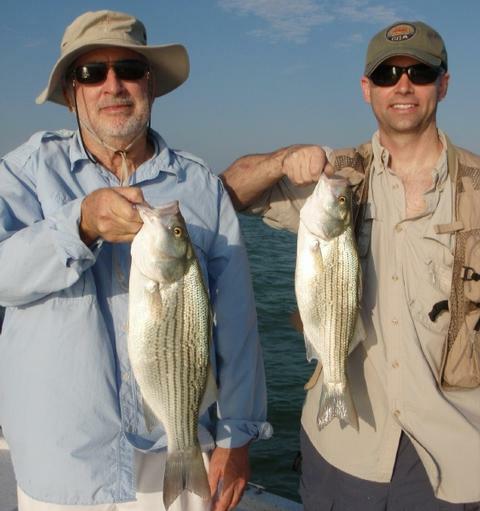 The Lord was good to us and granted one more hybrid to Sydney and one more white bass to Josh. With 49 fish boated for the morning, we called it a day. Sydney “struck again” as we prepared the boat and were about to clear the downrigger lines and reel the balls in. In her deepest, most serious voice she said to Josh and I, “Okay boys, let’s bring ’em in.” She then chuckled and said, “I’ve always wanted to say that!”. Sydney and Josh’s dad, Dameon is a Sergeant First Class in the U.S. Army and is serving in Kuwait, providing communications support to units in Kuwait and Iraq. He is on a 1 year deployment which will end in February of 2012. His wife and 5 children eagerly await his return. By that time his oldest son, Devonte, will have left for college in San Angelo where he’ll be a part of the Air Force ROTC program. Thank you all for you support, donations of money and equipment, your time spent fundraising, and your notes of encouragement to keep S.K.I.F.F. afloat!! Wind: Winds were S4 at trip’s start, slowly turning SW2-3 by trip’s end.